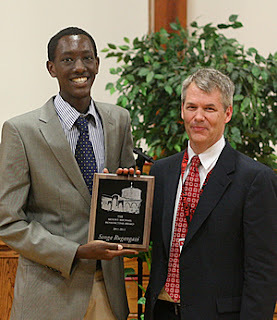 At the Annual Awards Night ceremony Songa Rugangazi was presented the Mount Michael Benedictine Award from Head of School Dr. David Peters. Songa was selected by the faculty through secret ballot as the student who best represents the ideals of Mount Michael Benedictine. Songa is the son of Ben and Mary Rugangazi of Rwanda. He has been accepted to numerous schools for next fall including George Washington University, Purdue University, South Dakota School of Mines and Technology, the University of Massachusetts at Amherst, and the University of Wisconsin at Madison. Songa has decided to attend Purdue University where he will major in industrial engineering. Other notable awards announced at the ceremony were Thomas Feichtinger with the Key Staffer award for Journalism, Rowan Gruber and Scott Townsend with the Hugh O’Brien Youth Leadership Award, Andy Johannes with the Exchange Club Sophomore of the Year award, Joe Kucirek for Boy’s State, and the Saint Benedict Award for Ministry to Sean Kruger and Lucas Buehler.